We will construct a custom kit to wire your street rod, kit car, Jeep or other vehicle and usually ship it out within 24 hours. 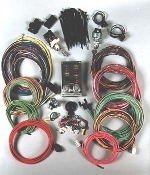 In most cases you can wire your vehicle in less than one day. Our kits feature the "point-to-point" wiring system which uses color-coded and labeled high temperature cross-link wires. Wires run directly from the fuse panel to the destination marked on each and every wire. This point-to-point system is much less confusing than competitors kits which force you to connect everything individually to the fuse panel. Our tiny PDP-1B fuse panel (3.5" x 6.0") uses lugless connectors to eliminate ring terminals, which can be the source of many problems. The correct connectors are pre-installed to eliminate errors and speed installation. Heavy-duty feed terminals are provided with heatshrink tubing, locking nuts and solder for maximum reliability. A ground system is included with the fuse panel to help wire fiberglass rod bodies. Safety is one of our top priorities. We use extra-heavy cross link wires and fuselinks to help protect your vehicle. All terminals are soldered for maximum reliability. Cross-link wire functions at full capacity even in your engine compartment. That s why this kit comes with Centech s standard one-year warranty.